The office applies for a license to conduct domestic aviation transport business. The Transportation Council recommends JAL (representative: Mr. Aiichiro Fujiyama) to be as a qualified domestic aviation transport business to the Minister of Transport. JAL acquires an air transportation license for domestic scheduled flights. JAL is amalgamated with Japan Air Transportation (Nihon Kouku Yusou) (representative: Mr. Koshichi Suzuki). 200,000 shares (10% of the whole) are offered to the public. The JAL General Foundation meeting (Executive Director and Auditor are elected) and the Board of Directors Meeting is held (Chairman, President, Executive Director and Managing Director are elected). Japan Air Lines Inc. is established with capital of 100 million yen. Chairman is Mr. Aiichiro Fujiyama, President Mr. Seijiro Yanagida. HQ is located on Ginza-nishi, Chuo-ku, Tokyo. 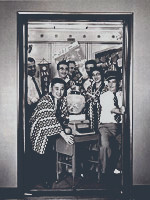 JAL establishes Tokyo head and sales office (8-1, Ginza-nishi, Chuo-ku,Tokyo). JAL establishes Fukuoka branch office and Sapporo local office. The first 15 stewardesses are employed at JAL. JAL establishes Osaka branch office. JAL concludes a consignment operation contract with Northwest Airlines, abolishing the contract with JDAC (Japan Domestic Airline Company). JAL launches the first civil aviation service in Japan since World War Ⅱ (establishing the domestic routes), with its first aircraft, Martin 202 'Jupiter'. (Tokyo=Fukuoka=Osaka). JAL sets up basic fares, round-trip discount fares and family discount fares. JAL initiates the in-flight meal service on its domestic flights (sandwiches in paper boxes). It starts the service on its international flights on February 2, 1954. JAL inaugurates the Fukuoka=Sapporo route. JAL introduces the first DC-4 'Uranus' service. The first general meeting of shareholders is held. JAL begins to include Misawa on the Tokyo=Sapporo route. JAL sets up group discount fares. JAL establishes a local office in Nagoya (Sasashima-cho, Nakamura-ku, Nagoya-shi). JAL begins to include Nagoya on the Tokyo-Osaka route. JAL begins to include Iwakuni on the Tokyo=Osaka=Fukuoka route. JAL submits an application to conduct international flights operational plan with the Ministry of Transport. JAL initiates a special discount system for shareholders. JAL signs a contract for the mail transportation consignment with the Ministry of Posts and Telecommunications. Establishment of Japan Airlines Maintenance Co., Ltd. (capital 50 million yen, President Seijiro Yanagida (7.7 registration). Company-owned first DC4 Takachiho-go arrives at Tokyo International Airport . JAL introduces the first-owned DC-4 aircraft 'Takachiho' to service the Tokyo=Osaka=Fukuoka route. Decision to send 11 pilot trainees and 2 flight engineer trainees to TALOA training center. JAL renews its license of 6 routes such as the Tokyo=Sapporo route ( applied on August 30), based on the Aviation Act (promulgated and enforced on July 15). Purchase of third company-owned aircraft DC4 Tokachi-go (former NW Tennou Hoshi-go). Martin202 aircarft is retired from service . JAL acquires business licenses for irregular air transportation service and aircraft use. JAL conducts the first special overseas flight between Tokyo and Manila to send back the corpse of the Philippine Ambassador to Japan. JAMCO maintenance staff member is qualified as the first airline plant inspector. 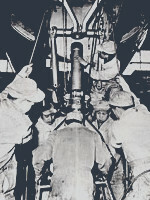 The first first-class maintenance staff is qualified in May 1953. The first two Japanese aviators are officially qualified. The Japan Air Lines Limited Law (JAL LAW) comes into effect (approved on July 24). A Japanese pilot acquires the first DC-4 co-pilot licence. JAL employed The first generation of stewards (10 persons). Under the JAL Law, the present Japan Air Lines Inc. is established. 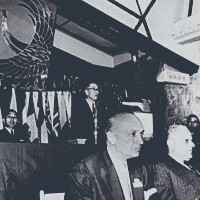 ( capital; 2 billion yen, Chairman; Mr. Kunizo Hara, President; Mr. Seijiro Yanagida). The former Japan Air Lines Inc. is dissolved. JAL introduces the first DC-6B aircraft 'City of Tokyo' on the Tokyo-Sapporo route. JAL establishes New York office. JAL inaugurates the Tokyo=Fukuoka route, as a extra nonstop service (with DC-6B plane). JAL revises stewardesses' uniform along with the establishment of international routes (designed by Mohei Ito, dark blue tight skirt). JAL inaugurates the Tokyo=Wake=Honolulu=San Francisco route as the first international flight service (with DC-6B plane, 2 round trips a week, one way fare; $650, ¥234,000). JAL establishes two seat classes, 'First Class' and 'Tourist Class (present Economy Class)' on its international routes. 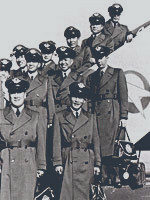 Five Japanese emplyees become the first to gain the qualification of flight engineer (DC-6B). Their Imperial Majesties of Showa Emperor and Kojun Empress board a JAL flight for the first time (Sapporo-Tokyo). Two Japanese acquire the first pilot license (DC-4). The first operation after the World War Ⅱby both Japanese pilot and copilot is realized (Tokyo-Fukuoka) on November 2. JAL extends the Tokyo=Okinawa(Naha) route to Hong Kong (with DC-6B plane). Two Japanese acquire the first qualification of dispatcher. JAL issues the first corporate bond of 500 million yen (Government guaranteed, allotted to the advance payment of DC-8 aircraft). JAL inaugurates the Fukuoka=Naha route (with DC-4 plane). JAL extends the Tokyo=Hong Kong route to Bangkok (with DC-6B plane). JAL operates the first chartered freighter (DC-4) on the Tokyo=San Francisco route. JAL introduces the first DC-7C aircraft 'City of San Francisco' to commence the Tokyo=Honolulu=San Francisco route. JAL extends the Tokyo=Hong Kong=Bangkok route to Singapore (with DC-6B plane). His Imperial Highness the Crown Prince (the Kinjo Emperor) boards a JAL scheduled flight for the first time (Tokyo-Sapporo). Inauguration of Operation Center (2.15 opening). JAL inaugurates the Tokyo=Honolulu=Los Angeles route (with DC-7C plane). JAL inaugurates the Tokyo=Anchorage=Seattle route (with DC-7C plane). JAL starts rolled hand towel service on its domestic flights, and distributes happi coats on its international flights. Sponsors 15th IATA General Meeting (Chaired by President Yanagida) in Tokyo( - 10.16). JAL introduces the remodeled DC-6 semi-cargo aircraft to replace the Tokyo=San Francisco private cargo freighter (DC-4 chartered aircraft). JAL participates in the formation of IATP (International Airlines Technical Pool). Affiliated in March, 1961. JAL inaugurates Northern route service to Europe (Tokyo=Anchorage=Hamburg=Paris) by joint operation with Air France (with B707 plane). JAL inaugurates to calling at Osaka on the Tokyo=Hong Kong route. JAL introduces the first DC-8 aircraft 'FUJI' on the Tokyo=San Francisco route .JAL changes the uniform of its stewardesses, according to the inauguration of jet flight (designed by Mohei Ito, dark blue colour with gold buttons). JAL introduces the DC-7C aircraft on the Tokyo=Sapporo route, the first introduction on domestic route. JAL introduces a private freighter service on the Tokyo=San Francisco route (with DC-6A plane, two round trips a week). His Majesty the Emperor Showa and Her Majesty the Empress Kojun board JAL jet plane (DC-8) to attend the National Athletic Meet in Kumamoto. JAL introduces the DC-8 plane on the Tokyo=Hong Kong direct route. JAL conducts a Asia/Africa special flight for the goodwill tour of Their Imperial Highnesses the Crown Prince (the Kinjo Emperor) and Princess with 'City of Osaka'.